Our 5-bedroom private pool home features spacious floor plan with large screened in pool area. This home does features a fully equipped kitchen, Two master suites with private bathrooms and Three Full bathrooms and can accommodate up to 12 guests and private pool. Smoking This home is 100% smoke free. Absolutely, no smoking allowed inside the home. There will be additional charge of up to $200.USD for additional cleaning to remove smoke odor. Pet Policy For the convenience of other guests and in an effort to help us provide the cleanest and most sanitary accommodations available, pets are not permitted. First of all the title of “Brand New Home” needs to be revised. As we walked in we knew this wasn’t true and when the owner, Edwin, came over to address issues we had he told us it was the oldest property that they owned. As the previous review stated (and was denied by the owner) there were ants but we found them to be all over the house not just in one bathroom. We told Edwin about this and he said we were in Florida so we should expect bugs. Edwin came over to check out the TV remotes that weren’t working in most of the rooms and said he would return with batteries, this never happened. The front door deadbolt lock is very difficult to unlock. Edwin was told about this but nothing was done. There are several lights in kitchen that are burned out, the front of one drawer in kitchen fell off and we couldn’t open cupboards throughout the house as they were stuck shut. We purchased felt pads to fix this issue. The air handler filter needs to be replaced. When we arrived there was a bucket under the garbage disposal because of a leak. We were told their handyman would be over February 6 between 11:00 and 12:00. He arrived one week later, fixed the leak but did nothing about the moldy bottom of the cabinet. The next inhabitants will see what we mean. The living room furniture needs to be replaced. The two sofas cushions are broken down and very uncomfortable to sit on. Between the cushions was full of crumbs. The recliner’s handle came off in our hand the first time we sat down. We replaced a screw in it but that only lasted a few days. All bedrooms could use new carpet, it is very matted down. The house did serve the purpose but we expected better. This was our first experience in renting and now know what to look for. We very much enjoyed the neighborhood and the Florida winter weather. At first glance the house was amazing, until we started to find faults. The property manager Mary is a very nice lady but if she met some of our requests it would’ve been much better. We couldn’t use one of the rooms because the cable wasn’t working and we reported it but it wasn’t fixed, one of the king bathrooms had an major ants problem and there was a hole in the screen by the pool. Other than that the house was pretty good. Hello 1st of all this review was put on the wrong home you did not stay in a brand new home you stayed in a 5 bed economy home which has 6 TV's so you're saying you had a bad stay because you had 5 TV's not a fair review we took care of the ant issue which was not major as soon as you contacted us . we do not appreciate these unfair reviews .A 2 star??. as it affects our rentals. I will definitely be reviewing you as well and warning other Host. The price is right. Perfect for large group and spacious. Very comfortable and homey feel. I loved the private pool, the house size was perfect for our large group. It was well equipped with linens and kitchen essentials. Close enough to the parks. We enjoyed our stay. Thanks for the awesome review! It was a pleasure having you as our guest ! We are so glad you loved the home !! Hope to see you again in the near future . This house is beautiful and clean nice quiet neighborhood. I will definitely stay here again! 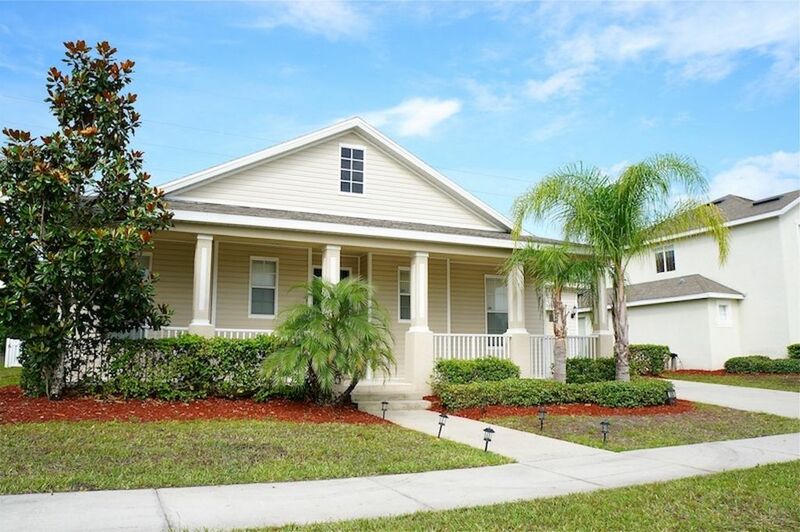 A beautiful home, 30 to 40 min from Universal and Disney. Well stocked with everything including the linens. Plenty of space. The pool wasn't heated but we enjoyed it anyway. The 2 small issues we had was taken care of timely and efficiently as possible . Mary was very nice. The neighborhood was quiet and felt very safe. Wifi was excellant. The beds were comfortable. Easy access to local things shopping, dining , souviner shops. 5 large bedrooms , a large kitchen, 3 great bathrooms, a wonderful patio with table and chairs by the pool and Jacuzzi that is completely screened in. I would highly recommend this home for families. We were 2 grandmothers, my oldest son and his fiance , a 21 , 15, 13 and 8 year old. This house helped to complete our vacation of a lifetime.